and doesn't reach maximum yield until it is 30 years old. 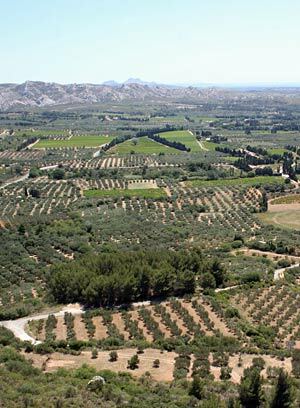 Olive trees bloom between April and June, and the fruit is picked from October to February, depending on the region. Pruning takes place in February and March, and gives rise to many a heated debate between different schools on how best to prune the branches of an olive tree. As the olives ripen they turn from green to black (there's no such thing as a black olive tree or a green olive tree, it's simply a question of timing the harvest). Where are olive trees ? Olive trees can be found in all 5 departments of the Provence-Alpes-Côte d'Azur region (Vaucluse, Var, Bouches du Rhône, Alpes de Haute Provence, Alpes Maritimes). In the Alpilles: Les Baux, Maussane, Tarascon, Fontvieille and Mouries (biggest French producer, with 75,000 olive trees). Each valley produces a different oil, with subtle variations in fragrance.